It’s great that there’s been some media interest — even in the UK — in the cross-examinations of candidate European commissioners which are happening this week and next in the European Parliament. Among a lot of surprisingly accurate coverage, one less plausible claim is also rearing its head. This is the suggestion that these hearings are less about choosing the right people for the job, and more about Parliament “flexing its muscles”. This week’s cartoon at the head of the Economist’s ever-cynical Charlemagne column makes the point vividly. This is a good example of a more general paradox that surfaces now and then in the narrative cycle of the eurosceptics. The main theme of this narrative is that Europe supposedly suffers from a democratic deficit (being run by a sprawling, unelected bureaucracy intent on undermining national sovereignty, blah blah). This is false, of course, but this doesn’t matter to the eurosceptics: most of the time they can keep spinning the same yarn, and the British media will keep lapping it up, with seemingly no inclination to check it against reality. But, from time to time, reality gets a little harder to ignore. One of those times is now. The European Parliament, made up of directly-elected MEPs, has a duty (under a treaty written jointly by all 28 EU countries) to scrutinise European Commission candidates, assess their suitability for the job, and either approve or reject them. This process forms the beginning of Parliament’s continuous supervision of the Commission, which sees its members regularly called to explain themselves before MEPs in the course of their work. This is a genuine, important, and above all conspicuous example of democracy in action at the heart of the European Union. It cuts across the eurosceptic narrative far more obviously than other ‘inconvenient truths’ which our media try to hush up — such as the fact that all EU laws are passed by elected governments and directly elected MEPs, or the fact that the supposedly “sprawling” Commission is actually a pretty small organisation, with fewer staff than Leeds city council. 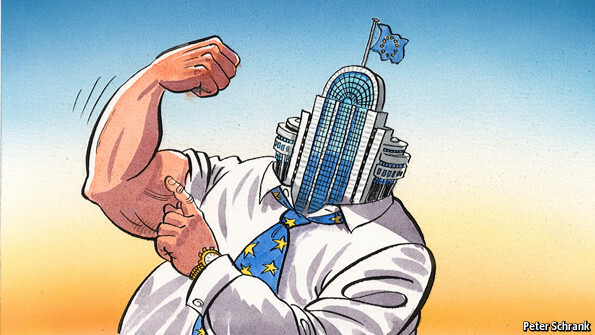 Armed with the superficially attractive argument that it is the only European institution directly accountable to voters, the parliament has accrued powers over the past few decades. Like a child receiving sweets, each goody it acquires feeds its demands for more. But hold on a minute. Firstly, MEPs are indeed directly elected by citizens, and that mandate empowers them to do the very jobs that national governments ask — indeed, require — them to do: agreeing new rules jointly with ministers, scrutinising the Commission, overseeing the budget. If we’re going to dismiss democratic oversight in these key areas as a “superficially attractive argument”, then the future of representative democracy is in dire straits indeed. Secondly, the whole premise of the eurosceptic argument is ludicrous. The Commission-designate that MEPs are holding to account right now is the very same group of people whose supposed unaccountability is lamented by eurosceptics for the other 364 days a year. Equally, when our elected MEPs veto a cosy budget deal or rewrite a dodgy law, it takes a particularly disingenuous form of chutzpah to brand that as a parliamentary power-grab in the same breath as complaining that ordinary voters have no influence over EU policy-making. They really can’t have it both ways. It’s been very clear for some time that the EP elite see themselves as being superior to national governments – This is just another way of rubbing noses in the dirt. None of this makes the Commission choices, nor the whole process, more democratic. The selection hearings are all about making the commission more compliant to the EP’s desires. This is an ongoing power grab, and this will not stop until the EP has ultimate power, which wasn’t in any treaty, or they are slapped down…. What a very strange comment, Bryan. It sounds as though you would prefer an unelected Commission to go straight into power with no examination by those that we have actually elected. Or are you in fact one of the new commission candidates, just trying to get out of your EP grilling? Thanks for the post. I think it may over-interpret the column slightly. I didn’t go into much detail on the hearings (largely because I was filing at the time the big ones were taking place). In theory, and sometimes in practice, I think they are an effective check on commissioners, and it’s certainly better to have them than not. I’m not convinced the parliament has covered itself in glory this time around, looking at the partisan hue of some of the more troublesome hearings, though perhaps the US Congress is no better in that regard. Nor do I speak about a democratic deficit in the EU. I find that notion less persuasive than ever, although largely because of the rise in prominence of the Council rather than the EP. Although the parliament is directly elected it doesn’t appear to have hastened the creation of a European demos, party groupings mean very little to most voters and the Spitzenkandidat process doesn’t really seem to have captured the imagination of many, as I mention. It seems to me there remains a substantial gap between the fact of direct elections and the claim of accountability, and the parliament is still a way off filling it. as one of the commissioner said, the political groups could have put a little more order and discipline in this exercise. Notwithstanding, some arbitrary or unwise choices by some MS had to be corrected. This showed that Juncker, in spite of his democratic endorsement, was probably unable to influence very much these choices beforehand. I believe that the President designate should himself select the candidates and that it should take a negative vote either by the Council or the EP to veto his proposal. The election of the next President of the Commission will probably be still more democratic and transparent – perhaps with formal primaries by the political parties. The image and legitimacy of the President designate will be re-inforced.